observe the following precautions regarding the srs airbags. The driver and all passengers in the vehicle must wear their seat belts properly. The srs driver airbag deploys with considerable force, and can cause death or serious injury especially if the driver is very close to the airbag. Move your seat to the rear as far as you can while still reaching the pedals comfortably. Slightly recline the back of the seat. 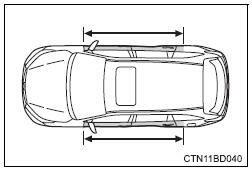 Although vehicle designs vary, many drivers can achieve the 10 in. (250 Mm) distance, even with the driver seat all the way forward, simply by reclining the back of the seat somewhat. If reclining the back of your seat makes it hard to see the road, raise yourself by using a firm, nonslippery cushion, or raise the seat if your vehicle has that feature. If your steering wheel is adjustable, tilt it downward. This points the airbag toward your chest instead of your head and neck. If the seat belt extender has been connected to the front seat belt buckles but the seat belt extender has not also been fastened to the latch plate of the seat belt, the srs front airbags will judge that the driver and front passenger are wearing the seat belt even though the seat belt has not been connected. In this case, the srs front airbags may not activate correctly in a collision, resulting in death or serious injury in the event of a collision. Be sure to wear the seat belt with the seat belt extender. Improperly seated and/or restrained infants and children can be killed or seriously injured by a deploying airbag. An infant or child who is too small to use a seat belt should be properly secured using a child restraint system. Toyota strongly recommends that all infants and children be placed in the rear seats of the vehicle and properly restrained. The rear seats are safer for infants and children than the front passenger seat. Do not sit on the edge of the seat or lean against the dashboard. 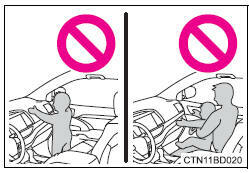 do not allow a child to stand in front of the srs front passenger airbag unit or sit on the knees of a front passenger. 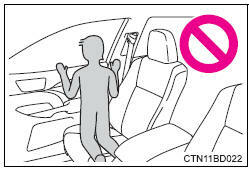 Do not allow the front seat occupants to hold items on their knees. 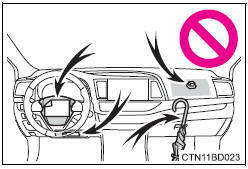 Do not lean against the door, the roof side rail or the front, side and rear pillars. 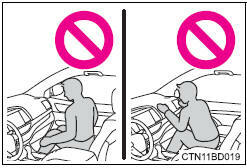 Do not allow anyone to kneel on the passenger seat toward the door or put their head or hands outside the vehicle. Do not attach anything to or lean anything against areas such as the dashboard, steering wheel pad and lower portion of the instrument panel. These items can become projectiles when the srs driver, front passenger and driver�s knee airbags deploy. Do not attach anything to areas such as a door, windshield, side window, front or rear pillar, roof side rail and assist grip. Vehicles without a smart key system: do not attach any heavy, sharp or hard objects such as keys and accessories to the key. The objects may restrict the srs driver�s knee airbag inflation or be thrust into the driver�s seat area by the force of the deploying airbag, thus causing a danger. Do not hang coat hangers or other hard objects on the coat hooks. All of these items could become projectiles and may cause death or serious injury, should the srs curtain shield airbags deploy. ?œIf a vinyl cover is put on the area where the srs driver's knee airbag will deploy, be sure to remove it. Do not use seat accessories which cover the parts where the srs side airbags and srs seat cushion airbag inflate as they may interfere with inflation of the airbags. Such accessories may prevent the side airbags and seat cushion airbag from activating correctly, disable the system or cause the side airbags and seat cushion airbag to inflate accidentally, resulting in death or serious injury. Do not strike or apply significant levels of force to the area of the srs airbag components. 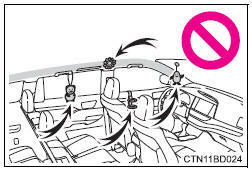 Do not touch any of the component parts immediately after the srs airbags have deployed (inflated) as they may be hot. If breathing becomes difficult after the srs airbags have deployed, open a door or window to allow fresh air in, or leave the vehicle if it is safe to do so. Wash off any residue as soon as possible to prevent skin irritation. If the areas where the srs airbags are stored, such as the steering wheel pad and front and rear pillar garnishes, are damaged or cracked, have them replaced by your toyota dealer. 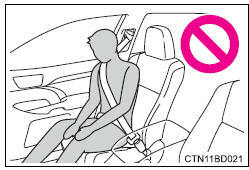 Do not place anything, such as a cushion, on the front passenger's seat. Doing so will disperse the passenger's weight, which prevents the sensor from detecting the passenger's weight properly. As a result, the srs front airbags for the front passenger may not deploy in the event of a collision. Do not dispose of your vehicle or perform any of the following modifications without consulting your toyota dealer. The srs airbags may malfunction or deploy (inflate) accidentally, causing death or serious injury. Bruising and slight abrasions may result from contact with a deploying (inflating) srs airbag. A loud noise and white powder will be emitted. 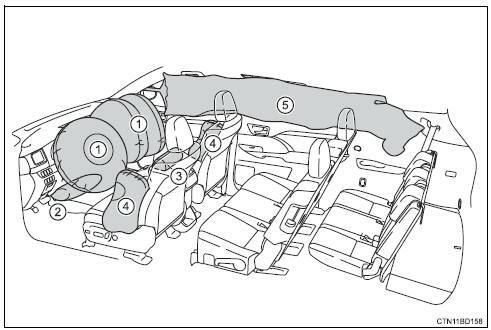 Parts of the airbag module (steering wheel hub, airbag cover and inflator) as well as the front seats, parts of the front and rear pillars, and roof side rails may be hot for several minutes. The airbag itself may also be hot. For u.S.A.: For safety connect subscribers, if the srs airbags deploy or in the event of a severe rear-end collision, the system is designed to send an emergency call to the response center, notifying them of the vehicle's location (without needing to push the "sos"¸ button) and an agent will attempt to speak with the occupants to ascertain the level of emergency and assistance required. If the occupants are unable to communicate, the agent automatically treats the call as an emergency and helps to dispatch the necessary emergency services. The srs front airbags will deploy in the event of an impact that exceeds the set threshold level (the level of force corresponding to an approximately 12 - 18 mph [20 - 30 km/h] frontal collision with a fixed wall that does not move or deform). 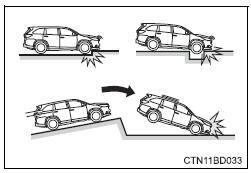 depending on the type of collision, it is possible that only the seat belt pretensioners will activate. The srs front airbags for the front passenger will not activate if there is no passenger sitting in the front passenger seat. However, the srs front airbags for the front passenger may deploy if luggage is put in the seat, even if the seat is unoccupied. 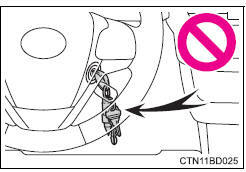 The srs seat cushion airbag on the front passenger"�s seat will not operate if the occupant is not wearing a seat belt. the srs side and curtain shield airbags will deploy in the event of an impact that exceeds the set threshold level (the level of force corresponding to the impact force produced by an approximately 3300 lb. 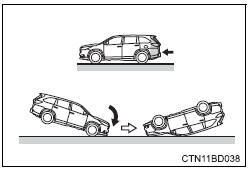 [1500 Kg] vehicle colliding with the vehicle cabin from a direction perpendicular to the vehicle orientation at an approximate speed of 12 - 18 mph [20 - 30 km/h]). 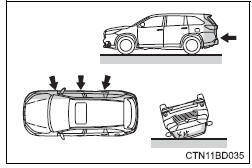 The srs curtain shield airbags will deploy in the event of vehicle rollover. 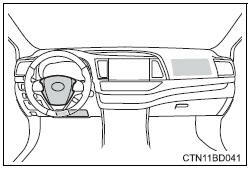 The srs side and curtain shield airbags may also deploy in the event of a severe frontal collision. 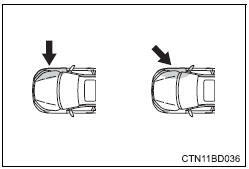 The srs front airbags and srs side and curtain shield airbags may also deploy if a serious impact occurs to the underside of your vehicle. Some examples are shown in the illustration. 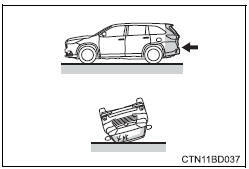 The srs curtain shield airbags may also deploy under the situations shown in the illustration. The srs front airbags do not generally inflate if the vehicle is involved in a side or rear collision, if it rolls over, or if it is involved in a low-speed frontal collision. But, whenever a collision of any type causes sufficient forward deceleration of the vehicle, deployment of the srs front airbags may occur. 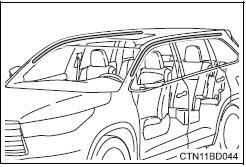 The srs side and curtain shield airbags may not activate if the vehicle is subjected to a collision from the side at certain angles, or a collision to the side of the vehicle body other than the passenger compartment. 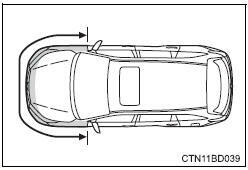 The srs curtain shield airbags do not generally inflate if the vehicle is involved in a rear collision, if it pitches end over end, or if it is involved in a low-speed side or low-speed frontal collision. 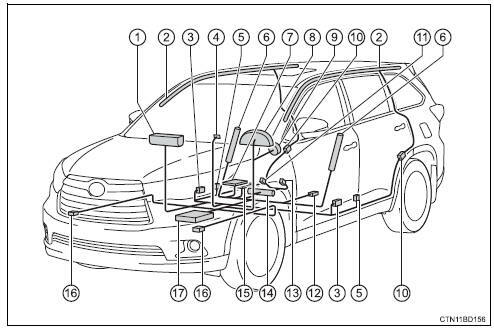 In the following cases, the vehicle will require inspection and/or repair. Contact your toyota dealer as soon as possible. Any of the srs airbags have been inflated. The front of the vehicle is damaged or deformed, or was involved in an accident that was not severe enough to cause the srs front airbags to inflate. A portion of a door or its surrounding area is damaged or deformed, or the vehicle was involved in an accident that was not severe enough to cause the srs side and curtain shield airbags to inflate. The pad section of the steering wheel, dashboard near the front passenger airbag or lower portion of the instrument panel is scratched, cracked, or otherwise damaged. The front passenger�s seat cushion surface is scratched, cracked, or otherwise damaged. The surface of the seats with the side airbag is scratched, cracked, or otherwise damaged. The portion of the front pillars, rear pillars or roof side rail garnishes (padding) containing the curtain shield airbags inside is scratched, cracked, or otherwise damaged.